St. Andrew School’s mission is to educate the whole child through our Catholic faith. St. Andrew School challenges all students to use their special gifts and talents to continue to grow in knowledge, discipleship, and faith with the support of family, parish, school, and community. St. Andrew offers classes from kindergarten through eighth grade. We offer full- and half-day kindergarten and two classes per grade. In addition to award-winning teachers, the school staff includes a nurse, a guidance counselor, maintenance personnel, teacher aides, librarians, and a team of administrators including the principal and vice principal. The school’s curriculum is based upon the Diocesan Guidelines and the Ohio Standards, St. Andrew School is 100 percent compliant with the Operating Standards for Ohio’s Catholic Schools. On May 7, 2010, the Commission of the Ohio Catholic School Accrediting Association granted St. Andrew School full accreditation, in the Ohio Catholic School Accrediting Association, (OCSAA). To learn more about St. Andrew School, visit www.standrewschool.com. Providing a Catholic education to all who desire it is fundamental to the mission of St. Andrew Parish. The primary purpose of our Catholic school is to assist parents in handing down the meaning of our faith from one generation to the next. Unfortunately, for some families cost can stand in the way of providing a quality, faith-focused education for their children. In an effort to make a Catholic education accessible to all who want it, the parish established the St. Andrew Parish Elementary School Tuition Assistance Fund. For nearly 20 years, parish families have benefited from this assistance, but we need your continued support. For more information about Tuition Assistance at St. Andrew and how you can help, click here. 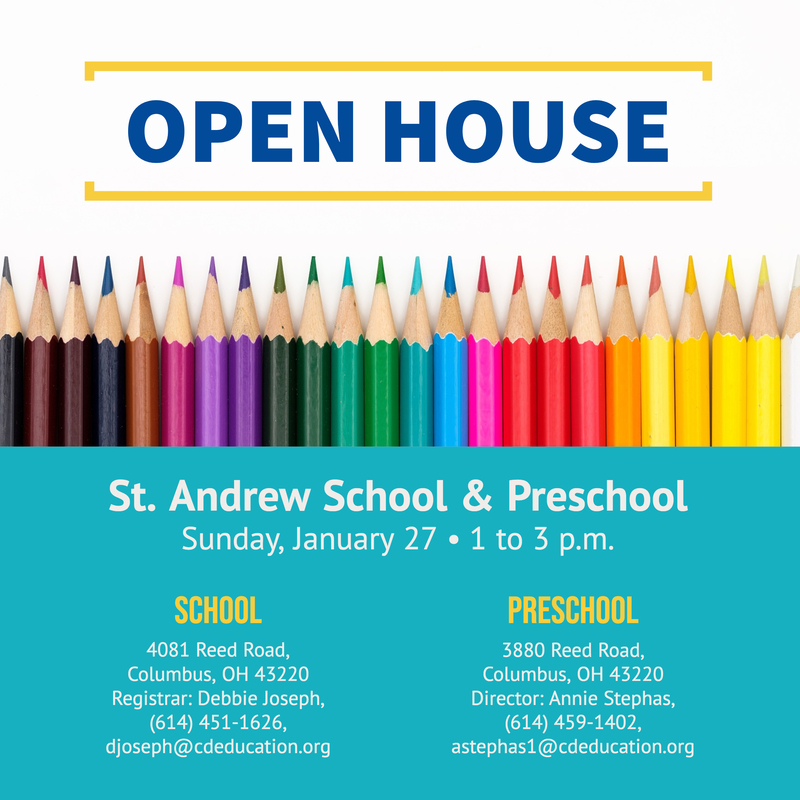 2019 St. Andrew School Open House: Sunday, January 27, 1 to 3 p.m.